If I could change history, I would like to change the diplomatic policy of Heungseon Daewongun, who had started to rule as regent when King Gojong(1863~1907) took the reign in 1863, during the latter part of Joseon dynasty. Heungseon Daewongun had done an excellent job in reforming Joseon, breaking down politics by in-powers and working to expand national finance as well as stabilizing public welfare. However, his act of “reforming” was only an act of reorganizing old and traditional regimes, instead of searching for a new society. This kind of reform also influenced his diplomatic policy of Joseon. Heungseon Daewongun had executed a policy known as “Refusing Diplomatic Relations Policy”, and put up Anti-foreign Stele, showing his strong will to refuse diplomatic relations with other countries. Although his policy had temporarily guarded the nation against the invasions of Western Powers, the backfiring effect of his policy was much huge. His policy had hindered the development of modern culture of Joseon dynasty. However, we could notice that the society of Joseon dynasty showed signs of modern development, from the fact that rigid caste system of Joseon was starting to collapse and how pop culture was also being developed. Therefore, I think Joseon could have developed much faster into modern society if Heungseon Daewongun had opened up to other foreign countries. might have developed at a much faster speed, and walked shoulder to shoulder with other powerful countries, without facing the colonization of Japan. dynasty who played a leading role in solving diplomatic issues between Ming as well as Japan. new Joseon dynasty, Taejong(1400-1418). At first, they both had radical ideas on reforming Goryeo, also regarding the possibility of overthrowing the king if they needed to. However, when Jung Mong-ju found out that Lee Bang-won was planning to build a new dynasty and crown Lee Sung-ghe as king, he realized that he and Lee could not go the same way anymore. Unlike Lee Bang-wonʼs plan of establishing a new dynasty, Jung Mong-ju had opposed to this, thinking the Goreyo dynasty should be preserved. The two who had the same intention of reforming Goreyo had split, becoming the political opponent with each other. The story of Jung Mong-ju and Lee Bang-won exchanging poetry together is well-known. Through this event, they had confirmed for the last time of their intentions, and Lee Bang-won planned on removing Jung Mong-ju, a hindrance of his political plan, which had succeeded. Through removing Jung Mong-ju, the plan of establishing a new dynasty became easier. Regarding this fact, it seems like killing their political opponent was a wise decision when it comes to achieving their political goals. However, if you think about the reason why Jung Mong-ju was killed, it is not easy to say it was a “wise” decision. Jung Mong-ju was killed because he had a “different” perspective, not because he was just plain “wrong.” The thought of killing someone because of conflicting thoughts is strange and frightening. Somewhat influenced by this story, I think most people have the idea that people with different thoughts or ideologies cannot go together, and fighting against or removing them is an obvious thing to do. However, if the story of Jung Mong-ju and Lee Bang-won was not about removing political enemy but of co-existence, the way we see “difference” might turn a little bit differently from how it is now. 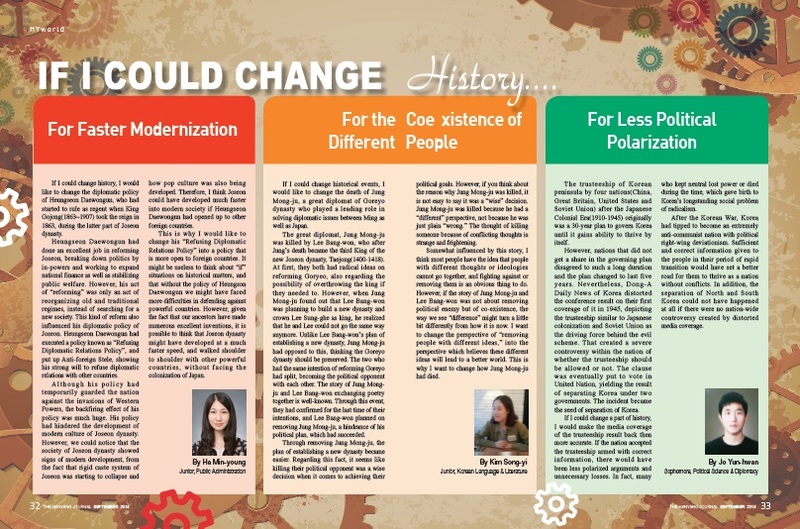 I want to change the perspective of “removing people with different ideas,” into the perspective which believes these different ideas will lead to a better world. This is why I want to change how Jung Mong-ju had died. The trusteeship of Korean peninsula by four nations(China, Great Britain, United States and Soviet Union) after the Japanese Colonial Era(1910-1945) originally was a 30-year plan to govern Korea until it gains ability to thrive by itself. coverage of it in 1945, depicting the trusteeship similar to Japanese colonization and Soviet Union as the driving force behind the evil scheme. That created a severe controversy within the nation of whether the trusteeship should be allowed or not. The clause was eventually put to vote in United Nation, yielding the result of separating Korea under two governments. The incident became the seed of separation of Korea. If I could change a part of history, I would make the media coverage of the trusteeship result back then more accurate. If the nation accepted the trusteeship armed with correct information, there would have been less polarized arguments and unnecessary losses. In fact, many who kept neutral lost power or died during the time, which gave birth to Korea’s longstanding social problem of radicalism. After the Korean War, Korea had tipped to become an extremely anti-communist nation with political right-wing deviationism. Sufficient and correct information given to the people in their period of rapid transition would have set a better road for them to thrive as a nation without conflicts. In addition, the separation of North and South Korea could not have happened at all if there were no nation-wide controversy created by distorted media coverage.